SAN BERNARDINO—Construction is officially under way on the long-awaited new courthouse in downtown San Bernardino for the Superior Court of San Bernardino County, the Administrative Office of the Courts announced today. Site work began on the seven-acre property donated by the City of San Bernardino at Third Street and Arrow Avenue, across from the old historic courthouse. When completed in spring 2014, the new courthouse will be the largest civic building constructed in downtown San Bernardino in half a century. In development since 2007, the landmark 11-story building will house 36 courtrooms and provide improved public access and security, increased efficiency of court operations, and significant relief for the court’s current space shortfall by replacing seven facilities and consolidating operations into a secure, seismically safe, modern court building. Sustainability features will save energy and make the building more efficient to operate in the long term. Construction had to wait until the State Treasurer’s Office completed a fall lease-revenue bond sale on November 9, with $304.7 million in proceeds allocated for construction of this project. The bonds were sold at interest rates lower than originally estimated, saving the state money that will benefit the courthouse construction fund in the future. The bonds will be repaid from court fees and penalties with no impact on the state’s General Fund. The courthouse project, which also received financial support from San Bernardino County, is expected to generate thousands of jobs among the subcontracting firms working on the project over the next two years with construction manager Rudolph and Sletten. In dollar terms, 95 percent of the construction work will go to California firms, and almost all will remain in Southern California. Fast-track scheduling by the construction partners enabled work to begin almost immediately after the financing was completed. The construction-manager-at-risk delivery method ensures the project adheres to its budget, with Rudolph and Sletten guaranteeing to deliver the project at a fixed price. 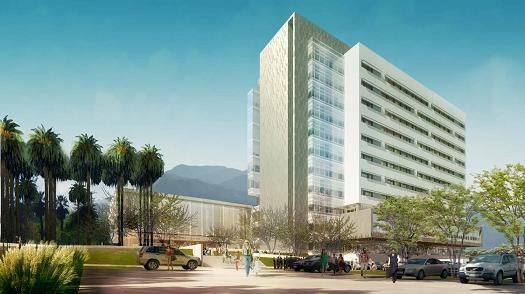 More information about the new San Bernardino courthouse project is on the California Courts website.